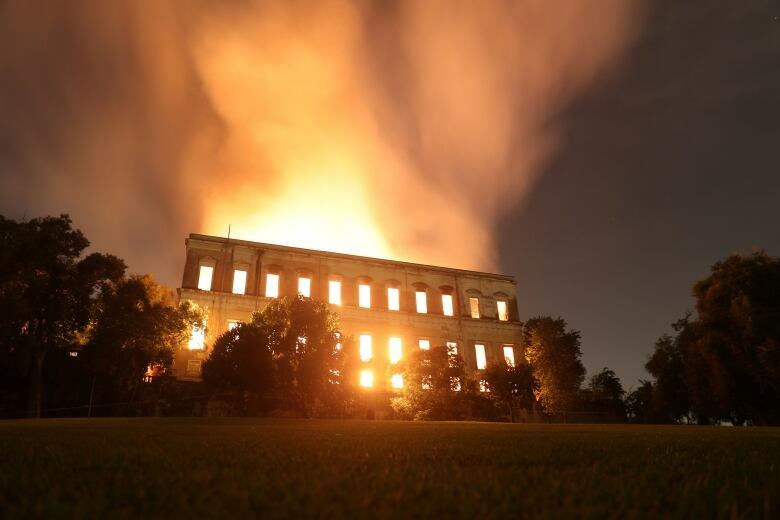 A huge fire engulfed Brazil's 200-year-old National Museum in Rio de Janeiro, lighting up the night sky with towering flames as firefighters and museum workers raced to save historical relics. Roberto Robadey, a spokesperson for the fire department, said 80 firefighters were battling the blaze and that by midnight, it was "just about under control" and should be out within a few hours. Museum director Alexander Kellner said Monday that part of the collection was destroyed Sunday night, but that it was not yet possible to detail what was lost. The museum had 20 million items, including Egyptian and Greco-Roman artifacts and the oldest human skull found in the Western Hemisphere. It was once the home of the Portuguese royal family. Smoke was still rising from the burned-out hulk of the building early Monday, as much of it appeared to have been gutted. A few hundred people crowded at the gates of the site, some in tears. 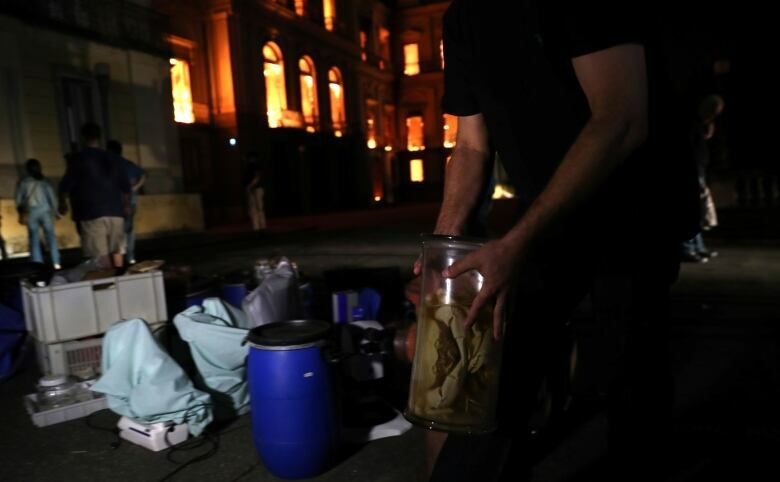 The museum had suffered from years of neglect under numerous governments, the institution's vice-director told the Globo TV network on Sunday night. "Everybody wants to be supportive now. We never had adequate support," said Luiz Fernando Dias Duarte. 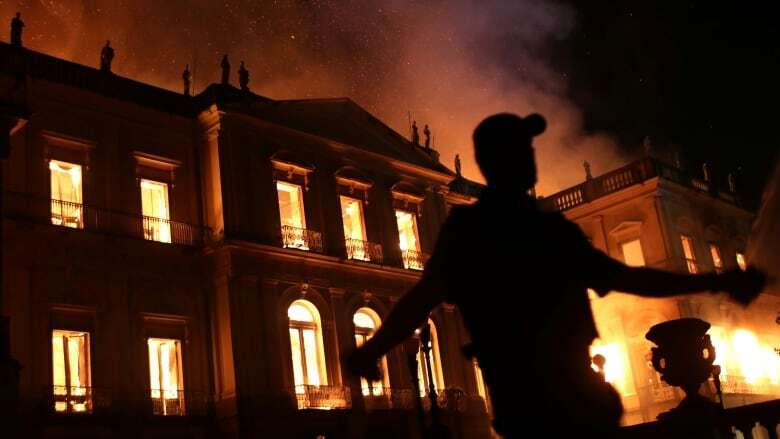 "We recently finalized an agreement with [state-run development bank] BNDES for a massive investment, so that we could finally restore the palace and, ironically, we had planned on a new fire prevention system." In a statement posted on its website in June, BNDES agreed to financing of $6.9 million Cdn to "physically restore the historic building" and carry out work to "guarantee more security to its collections." 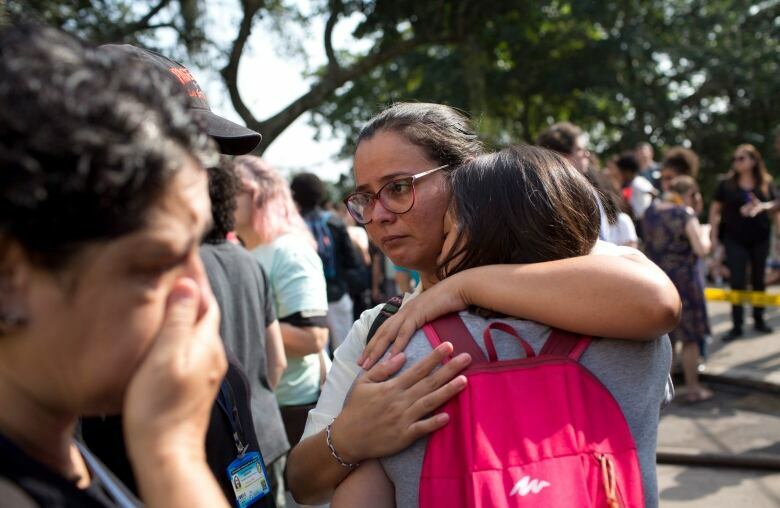 "Unfortunately, given the financial straits of the Federal University of Rio de Janeiro and all the other public universities the last three years, this was a tragedy that could be seen coming," tweeted Marina Silva, one of the leading presidential candidates. "It's a national obligation to reconstruct it from the ashes, recompose every eternal detail of the paintings and photos. Even if they are not original, they continue to be a reminder of the royal family that gave us independence, the [Portuguese] empire and the first constitution and national unity," he said.